Garage Door Pros has partnered with Virteom to educate our customers and community on garage doors, garage door repair, new installation, and garage door openers. We service Cuyahoga, Medina, and Lorain counties. Watch our video below to see how matching a new garage door to your home's exterior adds to Curb Appeal. Does Your Garage or Exterior Need a Facelift? Is your home in desperate need of a garage door facelift? Maybe you just want to add some curb appeal? Many customers first thought is to paint the house or add new siding, but the garage door is often overlooked. At Garage Door Pros, we have had customers call and ask what they can do to add to their garage door after they’ve gotten new roofs or siding and it still seems to be missing something. We recommend getting a new garage door! It adds the finishing touches to your home redesign making the picture complete finally. Watch our video above where Keith explains a situation with a customer. New Home? New Renovations? Get a Garage Door to Match! So, if you have invested a lot of money into renovations by adding new siding and roofing, a new garage door might just be that one extra push you need to really take what might be something that looks like an old and aged home into modernized real estate. Garage Door Pros can swap that door out in a couple hours for you and really boost the effect of your house. For more information or a free quote, call us at 216-978-2729 for Cuyahoga & Lorain Counties or 330-888-0400 for Medina County or click here. Can I Afford a New Garage Door? If youre continuously making small repairs to your garage door, now is the time to start shopping for a new garage door. Stop spending $60-85 every few months to repair your garage door and replace it today with one of the leading local garage door experts, Garage Door Pros. Affordable Garage Door Installation Here at Garage Door Pros, weve found that homeowners are pleasantly surprised when they hear what the cost of their garage door will be and how fast we can install their garage door. In our consultations, homeowners come in with a misconception that the garage door will be as expensive as any other exterior home repair, or that well be in their hair for a few days until the job is complete. Our installations only take 2-hours of time. Garage doors come in many different styles, colors, materials and with a plethora of accessories to choose from. Its hard to say there is a standard price, but a base price for a standard garage door, including installation, is just around $1,000. In 2006 our resident door pro, Keith, established Door Pros. 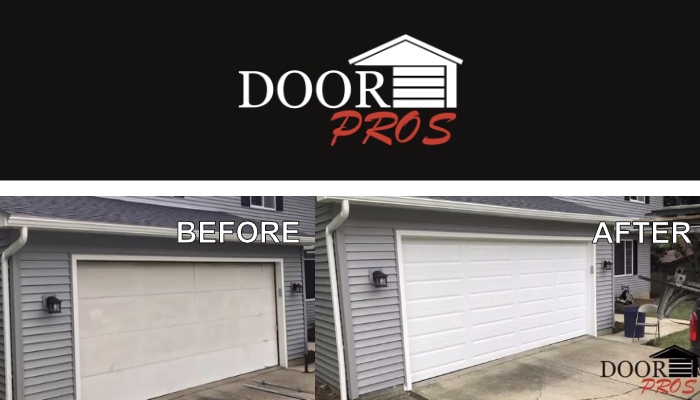 With over 22 years of experience in the garage door industry, Door Pros is your best bet for local garage door installation, door openers, and garage service.